Schwinn’s Women’s Voyageur 2 is a great all-around bike perfect for fun, fitness and transportation. 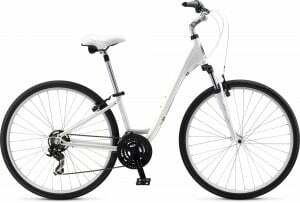 Its light and nimble-handling Schwinn aluminum frame boasts a comfortable upright riding position you’ll love, and you roll on 700c aluminum wheels that get up to speed with ease. You also get a suspension fork and seatpost for excellent comfort on all your rides. And there’s a precision-shifting Shimano 21-speed drivetrain for cruising over the hills and powerful linear-pull brakes for the ride back down. And you’ll cruise in comfort with the wide handlebars and plush seat.